For all information concerning the Main Street Renewal and McIlraith Bridge Redesign projects, please see our Main Street page. The OECA supports the proposed mid-town footbridge that would serve as an east-west link over the Rideau Canal and connect the communities of Old Ottawa East and the Glebe, as well as the larger city. Read the OECA's January 2012 letter of support to city staff for the project here. The environmental assessment for the proposed canal footbridge at Clegg and Fifth was approved summer 2013 and the city is now proceeding with detailed design work and looking for means to reduce the cost. Actual construction cannot proceed until the necessary funding is approved. Staff have advised that funding for construction of the footbridge has not yet been identified or approved, and scheduling will depend on priorities approved in the Transportation Master Plan. The OECA remains committed to fighting the construction of the Alta Vista Transportation Corridor (AVTC). The OECA has joined forces with neighbouring community associations to seek the removal of the planned $135 million roadway from the city’s Transportation Master Plan. Contrary to the city’s argument, the proposed AVTC would create even more traffic congestion, especially at the Nicholas ramp where it would feed into the Queensway, and we want the city to support a transit-centric alternative. 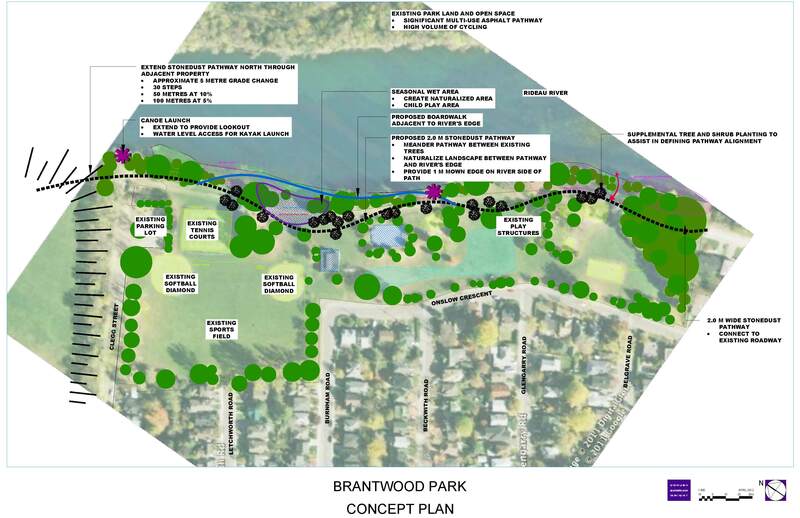 The proposed four-lane road is would run from Conroy and Walkley, through green spaces and parks in Alta Vista (behind the Ottawa Hospital’s General campus), through Hurdman Park, across the Rideau River to likely exit onto the Queensway via a new bridge just east of Springhurst Park. The corridor dates back to the 1960s and has been part of the city’s Official Plan since 1974. In early 2011, the city approved spending for the first section of the AVTC, a new road linking Riverside Drive and the Ottawa Hospital. We will continue to fight this development and will post new information about the status of the AVTC on our website. See also our archive page of older information about AVTC. As of August 2013, funding has been set aside by the NCC for the 2013-14 fiscal year for a safe pedestrian crossing of Colonel By Drive near Hartwell Locks at Carleton University and construction for this crossing is scheduled for fall 2013. Because the NCC anticipates that design and construction costs for the Hartwell Locks crossing will be less than the planned budget, they expect to proceed with the design of another pedestrian crossing at Queen Elizabeth Drive and Fifth Avenue and Colonel By Drive and Clegg Avenue in this fiscal year. This design will consider the proposals indicated by the City of Ottawa as a result of their potential pedestrian bridge crossing of the Rideau Canal at Fifth Avenue and Clegg Avenue. The NCC will have to incorporate the implementation of the two crossings into future capital funding requirements. In spring 2014, the NCC confirmed plans to move ahead with another pedestrian crossing at Queen Elizabeth Drive and Fifth Avenue. To read more about it, visit the NCC's website here. The OECA has been actively working with its sub-committee, Sustainable Living Ottawa East (SLOE), to establish a nature trail along the Rideau River, which serves as the eastern boundary of the Old Ottawa East community. For more information about this initiative, please visit SLOE's website. At a community meeting held on April 12, 2012, community residents met with landscape architect Martha Lush to discuss improvements to the Rideau River Nature Trail. View the draft concept plan prepared by Ms. Lush. View the OECA and SLOE’s recommendations to city staff and accompanying map for the design and implementation of the Rideau River Western Pathway. Highway 417, also known as “The Queensway” through Ottawa, is being widened by the Provincial Ministry of Transportation. Work on the section from the Nicholas Street interchange to the intersection of Regional Road 174 and 417 (the “split”) will begin in spring 2013. The work will be done in two stages, with stage one occurring between 2012 and 2014, and stage two between 2014 and 2015. The immediate impacts on Old Ottawa East will be the closing of the Lees Avenue on-ramp to the 417 eastbound, the rehabilitation of the 417 bridge over the Rideau River (Hurdman Bridge), and the replacement of the Lees Avenue overpass. An open house was held by the ministry on February 13, 2012, to explain the scope and duration of the work. Details of the work can be found at queenswayexpansioneast.com, as well as the OECA's letter to the ministry here. City officials presented an update to the OECA in June 2013. The Lees Avenue on-ramp was closed in June 2013 and will remain closed until 2018. Traffic which normally uses the Lees Avenue on-ramp will be routed south on Main Street, and then north on Riverside Drive to the Vanier east-bound on-ramp. Some traffic may opt to take Hawthorne to Pretoria and then onto the Metcalfe on-ramp. The work will also involve the rehabilitation of the 417 Hurdman’s Bridge. The final piece of construction involves replacing the Lees Avenue overpass over the 417. The overpass will be replaced using rapid replacement techniques and the work is scheduled to take place near the end of stage one in 2014. OC Transpo has traditionally travelled through Sandy Hill, Old Ottawa East and on to the various hospitals and clinics at the Ottawa General Hospital’s Smyth Road campus. This was the only direct bus which residents of Old Ottawa East could take to get to these institutions. In September 2011, OC Transpo eliminated the portion of route 16 which ran along Main Street to Smyth Road and the hospital campus. A trip to the hospitals that used to take five minutes now takes from 40 minutes to an hour, or more, and involves a minimum of two transfers. Residents of Old Ottawa East and Sandy Hill immediately raised strong objections to their respective councillors, to city staff and to OC Transpo. As a result of these objections, OC Transpo has begun two trips a day from Sandy Hill to the hospital campus through Old Ottawa East, and two return trips. These buses are designated as 5X. The two trips from Sandy Hill depart the corner of Chapel and Mann at 9:46 and 12:16, and the return trips depart from the General at 13:00 and 15:00. In March 2013, the OECA was advised that OCTranspo plans to reinstate the #16 bus on part of Main Street. As of April 21, 2013, the #16 bus now travels to Saint Paul University. The bus travels south on Main Street from Lees Avenue and turns into Saint Paul University's parking lot opposite Hazel Street. It runs on a 20 minute schedule during weekdays from 6:43 a.m. to 10:38 p.m., with service also available on the weekends. The twice daily service through Old Ottawa East to the Smyth Road hospitals, previously offered by the #5X, is now provided by the #16X. Southbound trips depart Lees station at 9:47 a.m. and 12:16 p.m., with return trips departing the hospitals at 1:00 p.m. and 3:00 p.m. View a map of the route changes. OCTranspo has not consulted the OECA on these changes, despite our numerous requests for consultation. The community has rejected this measure as being totally inadequate to meet the needs for hospital appointments, visits to patients, and for commuting to work at the campus. The OECA continues to work for a return of the full route 16 service, and would welcome your comments and examples of how you have been affected by the elimination of this service. The Main Street Streetscaping study, conducted in 1999, recommended traffic calming measures on Hawthorne Ave. E. These measures were occasionally included on the city’s list of things to do, but funding had never been available. However, funding for this work has finally been identified and residents of Hawthorne have been notified that the measurers, consisting of speed bumps and a bulb-out at the intersection of Hawthorne and Concord St. S., will be undertaken before the end of 2013. The city is also investigating the implementation of a pavement edge marking along the south side of the street to visually narrow the street to help channel traffic and cue motorists who are traveling the wrong direction on the street. The exact locations of the humps will be confirmed by the residents, Public Works staff, and the ward councillor.